A great corrective exercise movement to help your increase your squat depth, stretch your tight adductors, strengthen your hip abductors and back muscles. This movement will mobilise your pelvis, hips, knees and ankles. 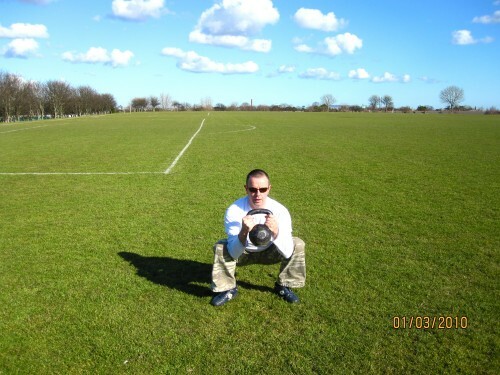 Clean one kettlebell by the horns or 2 kettlebells safely. Set your feet hip to shoulder width distance apart with equal turnout. Brace your abdominals and breathe in. Sit your hips down and back as if sitting into a low stool. As you descend ensure your femurs (thighs) point in the same direction as your toes.Sit as deep as you can maintain a neutral spine. Avoid tucking your tail bone underneath your glutes in the down position. This will result in the loss of neutral pelvis and lumbar spine. Set your elbows inside your knees and push elbows and inside knees together. Try to get a stretch for your adductors (inner thighs) here. Try to lenghten your spine in this static loaded position. You may do this movement actively eg: suqat down pause a moment and stand up, then repeat for reps. Or alternatively use it as explained above, as a corrective exercise.